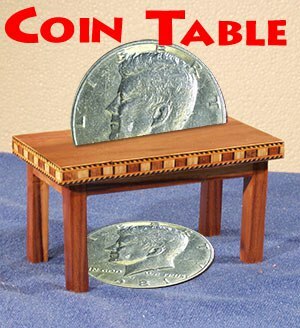 Http://www.penguinmagic.com/p/S22818 not gimmick coins but the table itself holds the coin via a special something. I'm posting because the good looking ones from Uday seem to be getting harder to find? So if you want to do David Roth's routine with ungimmicked coins better get soon. Just a heads up. I love David's routine and Gareth Gwatkin's just made me a miniature table with built in magnets. I sent him a handful of different magnetic coins to try and get the magnet strength to work as best as possible. I should receive it in a week or two as its coming from England. I have one of these in my store, and I was playing around with it. It's really cute! I think it would go nicely with a mini wizard doll, a little cup of tea; something like that. I use the original Chazpro table and they are still the best. If you can find one and really want to do this effect then don't settle for the best. The Chazpro style is still available. My father bought the rights from Chuck in the early 2002. The only difference is my brother uses exotic hardwoods when he builds them. The ones selling for 13.00 are crap from India and they stole the gaff. Anything other than what my brother builds are fakes and poorly made. The one I got from Penguin was nice for the price but there was some weird white glue coming from it...I would be very interested in seing the ones made by your brother Jake Jr. Is there any website I can go? Also interested in your Budget Hydro Die. Jake, is your brothers table with the sheet mag$&t on the underside? No, ti's the same gaff as the Chazpro.. That way any regular coins can be used. Right now he does them in half dollar and Morgan Dollar. I have found while using the prop that there can be noise. Those who have it will understand. If you would like my way of dealing with it pm me. Late to the party. I just acquired one of these and I'm baffled. The S*&T to hold the coin is not deep enough to hold any coin. Am I missing something??? It should just barely keep it in place so that a little tap will dislodge it. Maybe try a smaller coin?